You are here: Home / Family Entertainment / Who should see Marvel’s latest movie, Black Panther? Almost everyone. Who should see Marvel’s latest movie, Black Panther? Almost everyone. We had a chance to see Marvel’s latest movie, Black Panther, earlier this week. I am admittedly a huge fan of all things MCU (Marvel Cinematic Universe), so there was no question about whether we’d see it as soon as possible. As soon as Chadwick Boseman made his debut as Black Panther in Captain America: Civil War, there was no question about whether it would be great. Still, I was unprepared for just how great. Thanks to Marvel Studios for the chance for us to check out the film! All opinions are my own. From Marvel: “Black Panther” follows T’Challa who returns home to the isolated, technologically advanced African nation of Wakanda to become king, but when a powerful old enemy reappears, T’Challa’s mettle as king—and Black Panther—is tested when he is drawn into a formidable conflict that puts the fate of Wakanda and the entire world at risk. I hadn’t seen any spoilers – or even previews* – going into Black Panther. I think it was in large part because of this stance that my mouth fell open from about one minute into the movie, and I’m not sure I ever closed it for long. The film was full of surprises, laugh-out-loud moments, and truly stunning visuals. The music was absolute perfection, too. I’m actually not sure the soundtrack will play in my car very often, if at all, but it so beautifully echoed the juxtaposition of tribal traditions, modern culture, and a cutting-edge future. I was blown away. *This “no previews” thing is a) proving to be extremely difficult at times and b) the most likely reason you may find me in a psychiatric ward prior to Avengers: Infinity War. As my husband and I waited for the movie to start, we were looking at the “poster” that filled the theater screen. 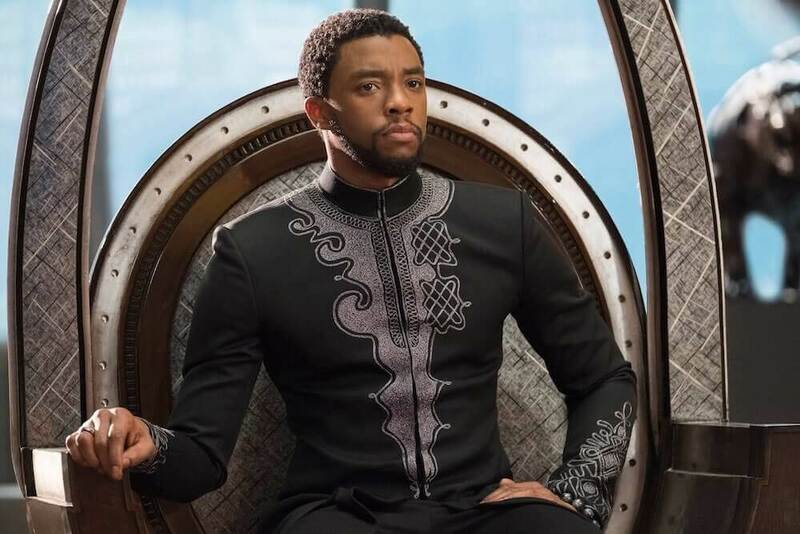 “I think it’s a testament to Chadwick Boseman, mostly,” I said, “but I swear – I just look at T’Challa and see regal.” In the short amount of time we saw him sans Black Panther suit in Civil War, he established himself as a leader, a dignitary, and someone who deserves the utmost respect. That combination of worthy royal and stellar superhero continues throughout Black Panther, as does Boseman’s superb acting. One thing it does that’s somewhat out of the ordinary, is marry a variety of settings – flawlessly, I might add. 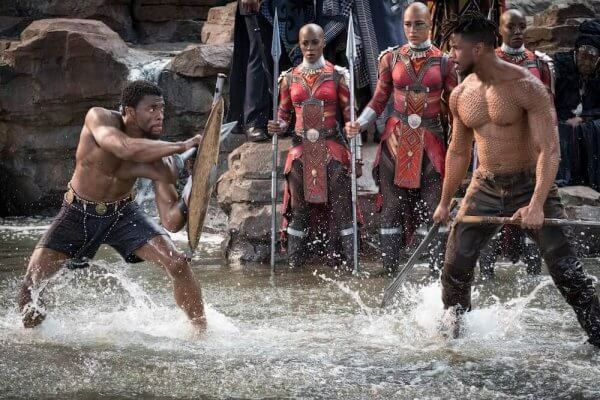 It’s somewhat difficult to address without giving any spoilers, but let’s start here: the world doesn’t quite know exactly what Wakanda has to offer… and many Wakandans like it that way. The story – while very much continuing the ultimate arc of the MCU – addresses important social justice issues around poverty, race, and human rights; it takes powerful stances, without making the movie feel like it’s sole purpose is proselytizing. Black Panther also does an extremely lovely job of highlighting and celebrating African culture. Much like Coco did as it addressed Dia de los Muertos and Mexican traditions, this film feels like it truly shares a window into another culture, versus Westernizing one to make it more comfortable. Watching it gave me many of the same feelings I get when I think about travel, and the important of expanding your worldview to understand just a bit better the uniqueness (and value) of other humans. But don’t worry, I get it. 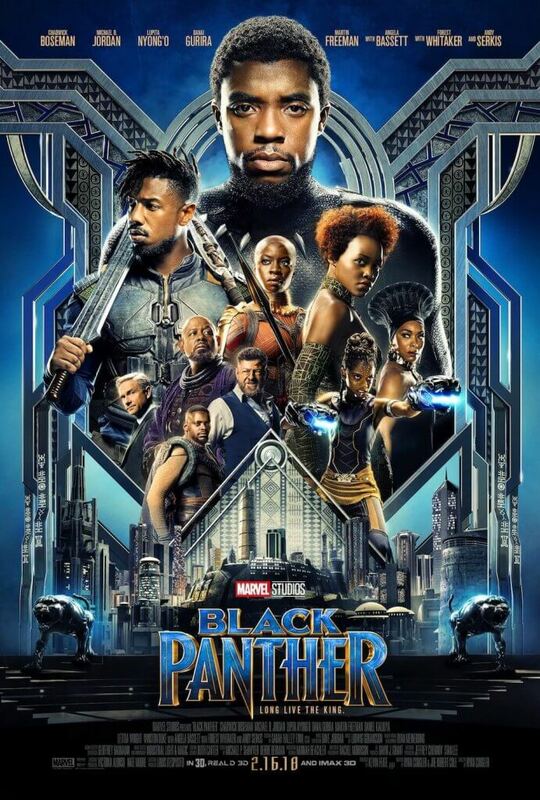 Many of us go to movies to escape; while Black Panther may challenge you along the way, it is genuinely enjoyable from start to finish. The dynamics of T’Challa’s family is totally endearing. I had questions about Wakanda (“Do the people know T’Challa is Black Panther? Are the king and Black Panther always one and the same? What is the end-goal of such a techologically advanced population that basically nobody knows about?”) and they were all answered in a way that was satisfying, but didn’t rely on unnecessary, distracting exposition. The wit we’ve come to expect from Marvel movie writers is there in plenty. There are enough car chases, hand-to-hand combat, weapons, and technology to hold just about anyone’s attention. It’s a really, really good film. I’ll be honest, it’s basically impossible for me to wrap my head around Black Panther without seeing it again. Some of my thoughts have centered around what the events of the movie mean for Avengers: Infinity War. Many of the thoughts I had, though, I’m not sure I can answer on my own. Our screening had several members of the media present, but also a much larger than usual contingent of the general public not “on assignment”. Most of the theater was filled with winners of a contest and members of a few large organizations that had come together; I would estimate that maybe ten of us were white. It wasn’t a surprise; Black Panther was the first black superhero in mainstream American comics, and this film is the first to be deeply rooted in not just an African American segment of a larger population, but in Africa. Understandably, it’s gotten a lot of attention from black audiences, some of whom have been waiting a long time for such a movie. And I’ll admit, that’s where – as a suburban white woman – I feel a natural disconnect. 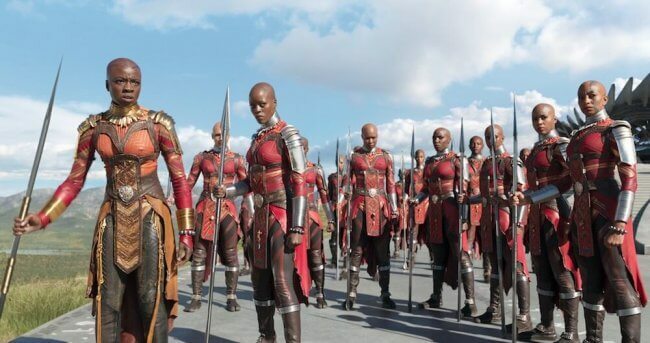 I find myself wondering if people of African descent – wherever they may be living now – feel a deep, almost visceral connection to the movie? 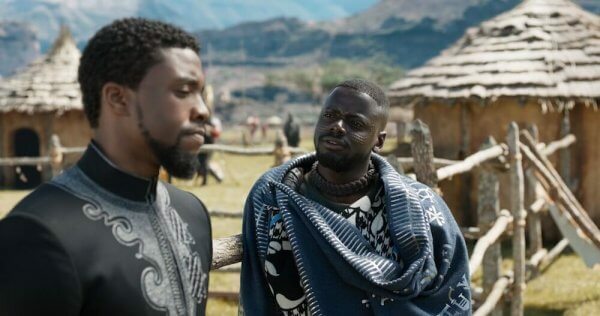 If the film connects black people all over the world in a way that’s bigger than comicbook heroes and even race relations in the US? If those things are thoughtful to ponder, or totally offensive? I mean, I’m sure everything I say offends someone, because 2018. But is it insensitive, and I don’t even know it? And what about the WOMEN in this movie?! I’m no feminist. Like, I think people should get equal pay for equal work, and should absolutely be treated with respect, regardless of gender… and that may be juuuust about where it ends for me. I have had no problem in saying I was bored sitting at a women’s tennis match – even watching GOAT Serena Williams – because it just wasn’t as fast or strong. I know, I know. I’m the worst. I definitely don’t go analyzing movies I watch and whether or not a man’s role could have been done by a woman, and why does Hollywood hate women, etc. But as I watched this movie, I just kept thinking dang! Basically the most awesome people in the entire movie are women. (I mean, give or take that Black Panther guy.) Women are the most respected in the military, and make up the entire royal guard. Women are insanely smart, and work to advance technology in unfathomable ways. Women boss ranking American government agents around, because they are more qualified… and dudes everywhere listen. Of course gender is never even mentioned, because why would it be? It’s just normal. Even this old-fashioned, non-feminist woman couldn’t ignore how cool that was. Is Black Panther Appropriate for Kids? We weren’t very far into the movie when I realized this is one our kids won’t see for a while. We’re pretty conservative when it comes to what our kids watch. They have seen 3/4 of the Star Wars movies, but only one Marvel film thus far (Captain America: The First Avenger). 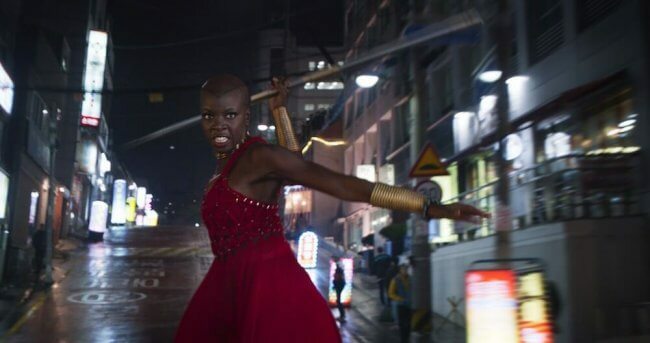 Many of them are simply too violent or have too much innuendo or content that they’re not ready to filter; Black Panther is easily the most graphic yet. It definitely earns its PG-13 rating! Regardless of when you find it appropriate for your children, I would definitely recommend screening it yourself before taking kids of any age. As a side note, we have read (or rather, listened to) all of the junior novelizations of the movies in the Marvel Cinematic Universe. This has been a great way for our kids to get the Marvel action they crave without watching movies that are too grown up for them. 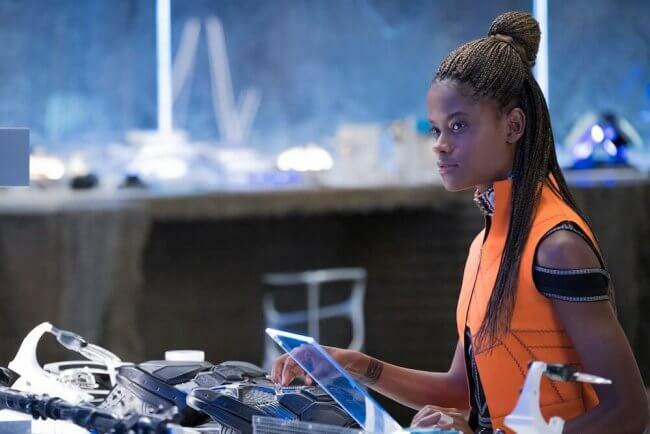 It also means we get to have some of the same great discussions that come from watching many Marvel films; the Black Panther story is certainly not lacking in important conversation topics! I’ve made a few appearances on the (coolest) movie podcast, The Deucecast Movie Show, on which one particular recurrent guest often gets made fun for for saying a movie is “important”. Really, are many movies important? And important to what? Film history, or the safety of the world? So while this gives me pause a little, I’m going to say it: Black Panther felt like an important movie… and did everything well while doing so.